Dirty Bomb has been in closed beta for a while now, but availability has been restricted to specific, limited times—most recently, the weekend of March 6-9. But developer Splash Damage has revealed that the beta will become [ominous voice] fully operational next week, and that everyone who has a key will be able to play whenever they want. "Thursday, March 26th is D-Day. At 9AM PDT/16:00 GMT Dirty Bomb will be back up for good," the studio announced in the Dirty Bomb forums. "Yes, the game is still in closed beta and everyone who has gotten a key will be able to play. What’s more is there will be no more planned wipes." It's unfortunate that the beta remains closed, although on the upside Splash Damage doesn't seem too stingy about handing out keys. And with the Dirty Bomb Steam page still indicating a June 2015 launch, and the announcement promising more "cool info" to be revealed next week, a move to open beta could be coming soon. 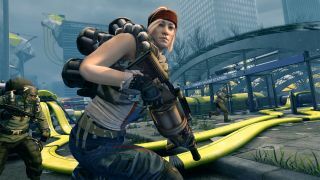 We spent some time with Dirty Bomb last October, and came away, if not entirely sold, then at least reasonably optimistic about its chances. We'll be checking out the game again soon, but for now you can read what we made of it last time here.